Ginger, one of the first spices to come to Europe in the Oriental Spice Trade, became widely popular for its sharp, warm, and spicy flavor among the Romans and Greeks. It originates from the root of a flowering plant that grows wild in tropical rainforests of Southern Asia. With its unique taste, aroma, and health promoting benefits, it really is no surprise that it is still widely used today. When it comes to Ginger, the benefits are quite eclectic. You can use it in the kitchen for its rich, spicy flavor, or you can store it in your home cabinet for its many health benefits. 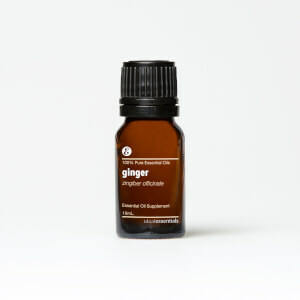 IdealEssentials Ginger Oil can be added to water or liquid to promote regular, healthy digestive function, massaged into exercise-induced sore muscles, and even added to your favorite Asian inspired dishes. If you’re looking for an oil with multiple uses, this is the answer. Step up your health and your cooking with ginger today! Step up your game in the kitchen and start using the sharp, warm, and spicy flavor of IdealEssentials Ginger Oil. It’s perfect for cooking your favorite Asian inspired dishes and makes it easy to put a new spin on some of your favorite recipes.